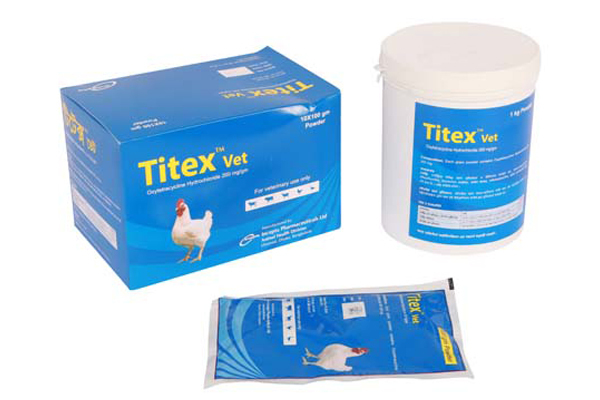 Titex DS Vet bolus: Each bolus contains Oxytetracycline Hydrochloride BP equivalent to Oxytetracycline 1000 mg.
Oxytetracycline is a proven broad spectrum antibiotic that is used in infectious diseases of domesticated animal and poultry. Oxytetracycline is prepared for oral, uterus, water and feed use. Oxytetracycline inhibits bacterial protein synthesis. Oxytetracycline sensitive gram positive and gram negative bacteria is cured by using Oxytetracycline bolus. Oxytetracycline bolus is dissolved with blood, pus or others body extract quickly and shows antibacterial action. Oxytetracycline bolus is used as an ideal pessary for the following diseases of cattle, buffaloes, horse, sheep & goat (eg. Metritis, Pyometra, Endometritis, Cervicitis, Parturition pain, Abortion and genetal tract disease after parturition). 1 bolus for 50-100 kg b.w. or Oxytetracycline 10-20 mg per kg b.w. of animal. Oxytetracycline is generally safe and effective but it and other tetracyclines may cause of the teeth discoloration or decaying teeth in young animals.